We’re now in the era of “STEM education” – Science Technology, Engineering, Mathematics” – and how the nuclear industry loves this! Don’t get me wrong. I think that everyone should have a good knowledge especially of maths and science. BUT – alongside the current fervour for STEM, is a very wrong downgrading of the humanities – the so-called “soft subjects”. At this critical time of climate change and nuclear danger, we really need the insights from art, history, culture, sociology – the human studies – to help us to know what to do. The nuclear industry thrives on this almost religious belief that technology is the answer. And of course, who is to educate us about nuclear technology, and how much we need it etc? That’s a no-brainer. On the whole, education about nuclear power relies on information from the nuclear industry. That is either not forthcoming or is a comfortable ‘we know best’ assurance, allied with technical information – designed to reiterate that only the nuclear experts can really understand it – so don’t bother your pretty little heads about it. Much of the media mindlessly regurgitates information from the industry, but fortunately, not all of it. It’s in academia that the nuclear industry increasingly gets a foothold, and of course, universities like to get the funding grants. Just a few examples: University of Birmingham (UK) University of Bristol; University of Oxford; Kyoto University. University of California. University of Tasmania. 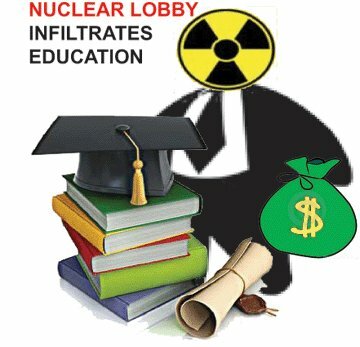 But, of course, the nuclear lobby ‘s “education” is all over the place, with the International Atomic Energy Agency (IAEA) running courses in the Asia Pacific and elsewhere. And Russia, expanding its nuclear propaganda to Asia, Africa, the Middle East. Community education is a nuclear lobby speciality – to Boy Scouts, many other organisations, and especially to where the industry wants to dump radioactive trash. Would we trust tobacco companies to control education about healthy lungs, and lung disease? So why rely on the IAEA etc for education about nuclear power?